One of the things I like to do the day after Easter is go to the stores and buy up a bunch of the Easter peeps on clearance. I really don't like the taste of peeps but once they are dehydrated, they are delicious! Just place in your dehydrator and turn it on. We kept them in for about 10 hours and removed them. At first the outside is crunchy and the inside is "mushy" but give them about 15 minutes and they become crunchy throughout. The whole taste changes and they are super delicious this way. Other interesting things I dehydrate include Watermelon & Making your Own Sun Dried Tomatoes! 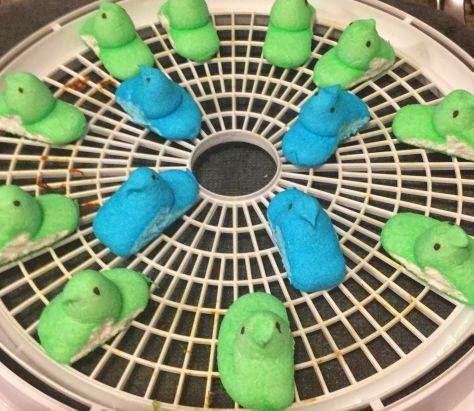 You get a similar effect by microwaving them until they puff into huge peeps, then remove from micro and let them shrink and cool. They don't stay as cute that way, though. You're right that they taste much better that way!